I am having an issue with installing the URCaps for the FT300 and the 3 Finger Adaptive Gripper on a UR5/CB3.0. I downloaded the .rar files from the Robotiq website, extracted the files, and copied onto an empty USB drive. Following this, I put the USB onto the Teach pendant and opened the files (in the URCaps setup in the Robot Setup) then rebooted the system. However, after the reboot, there was a yellow triangle with an exclamation mark inside which I assume means that the installation did not work correctly since the corresponding tabs for the sensor and gripper did not appear in the installation tab. I tried this a few times, checking to make sure that the files were correct but all with the same result. Is there a step I am missing? The instruction manuals seem to suggest that this is just a plug and play sort of thing and that the installation should just work. I was currently using Polyscope 3.3.4.310 (version from 6 December 2016 - around the time the university purchased the robot). After running an update to version 3.5.0.10584 (), the URCaps were installed!!! 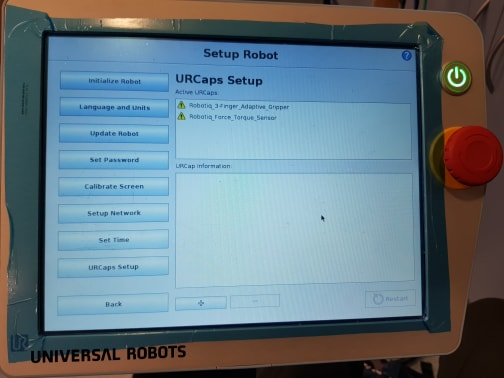 Hello @Aarjav, The latest URCap compatible with a CB3 controller is UCS 1.0.3. Anything more recent than that will simply not work. Hi @David_Levasseur, thanks for the quick reply! Yes, that is the version of URCap that I had tried and it did not work. Is there any other reason why this issue could be occurring? Attached is a photo of the error/warning/other symbol. Hello @Aarjav, This might be caused by a compatibility issue between the URCap version and the Polyscope version. Our URCaps are not ready for Polyscope 3.6 yet. What version of Polyscope are you running?